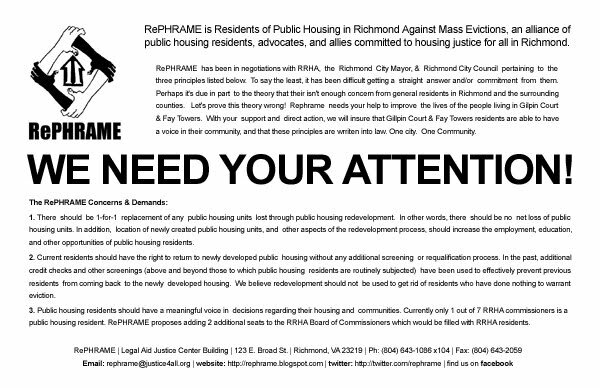 Important Struggle in RVA- ALERT!!! Print & Distribute! 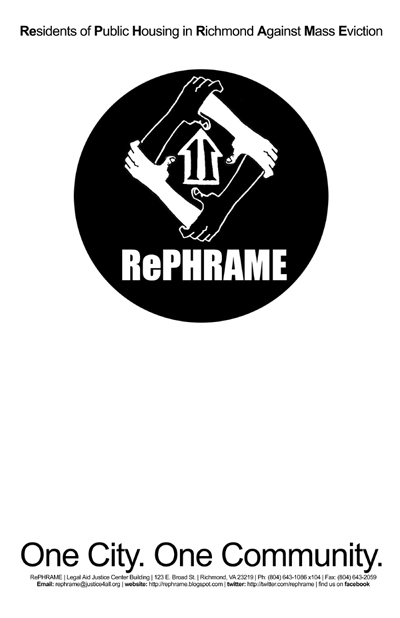 RePHRAME Propaganda! We understand that everyone who cares about any given cause can’t always take to the streets and be directly involved with the many many campaigns going on through out their community, but one quick and easy thing we can all do is print out a couple fliers and place them in strategic locations. ie. the office, coffee shop, bulletin board, or even in their own home. Please print and distribute freely any fliers, posters, pamphlets, leaflets, etc found on this site. Sharing is Caring, Trying is Daring?? Taking Back Richmond is a group of local community activists who participated in the takeover of a property abandoned by a local slumlord, Oliver Lawrence. We dispute his claim as owner of 2913 Montrose Avenue because he has shown absolutely no responsibility for the property- not paying back taxes, not upkeeping the property, and not being accountable to the neighborhood. We understand that the challenge to property rights upsets many people who fear the consequences of property rights becoming fallable. However, we hold that property rights are not inalienable and that in many cases upholding property rights allows individuals to commit property WRONGS in our city. Now, the activists are working on ways to put pressure on the slumlord as well as on Richmond City Council to change the ways that blighted and abandoned properties are dealt with in the city. In light of the current economy, home foreclosures, layoffs, unemployment and homelessness we say that it makes absolutely no sense to allow homes to sit empty when there are people in desperate need of housing. Instead of properties without paid property taxes going to auction and being sold to real estate speculators essentially the same as slumlords like Lawrence, we propose that a system be set up to sell those properties to low income folks at the price of the back property taxes owed the city under the conditions that the new owners commit to bringing the building up to code and living in the home for a period of time, perhaps 5 years. This would prevent house flippers and folks just looking to invest. Instead, we could fill abandoned homes with people who want to live there themselves and become parts of those communities. In the midst of record foreclosures and houses left empty all over the country, community activists in Richmond have been trying to clean up a blighted house and make it into a home. Now, they face threats of eviction and arrest from Oliver Lawrence, a notorious property speculator and slumlord.